Three weeks ago, I was sitting at the kitchen table eating breakfast while listening to episode 10 of the “Journey to Launch” podcast as host Jamilia Souffrant interviewed author and financial coach, Patrice C. Washington. 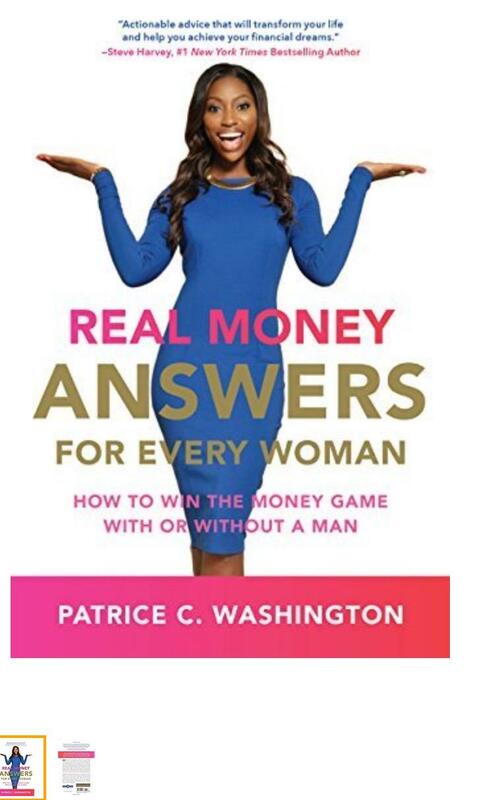 Ms. Washington is also known as the “Money Maven” and has written several books about managing personal finances. The conversation focused on Ms. Washington’s background prior to her becoming a world-renowned financial expert. Ms. Washington addresses how important it is to seek financial wisdom. She talked about emotional spending and how she was able to help others as she continued to restore herself after losing everything. She also stressed that personal finance is about personal responsibility. I learned so much from this episode that I immediately logged into to the Journey to Launch Facebook group and posted that I will be reading one of Ms. Washington’s books titled Real Money Answers for Every Woman. What is the subject of the book? Ms. Washington’s personal story is what drew my attention to the book initially. She came from humble beginnings, obtained wealth at a young age by way of real-estate, and lost it all during the last recession. This resonated with me because of my situation with the second home that I purchased during the recession. I wrote about it in an earlier post titled “A Review of the Second Home I Bought”. She and her husband were able to reestablish themselves and are on the path to financial freedom. The book covers topics such as saving, investing, paying for college tuition, teaching children financial responsibility, and marriage and finances just to name a few. The book is not written in the traditional chapter format. It’s comprised of several articles covering various financial topics. It literally answers every basic financial question one can think of. It is also easy to refer back to a specific section if you need a refresher course without having to read the book in its entirety. Lastly, the book serves as a workbook allowing readers to take notes in multiple sections for them to create their own financial blueprint. I took notes! Although the author dropped several jewels throughout the book, there are a few statements that really stood out to me. In the section titled Wealth Begins from Within, she asks, “Can you really continue to buy your children everything under the sun and expect them to respect money?” I mentioned this in an earlier blog post titled “A Reality Check for a Single Mother and Her Money.” In that particular post, I discussed my experiences with money and single parenting. Later in the book, she focuses on teaching children how to earn money instead of giving them an allowance. Education begins at home. Teach your children about finances early and set an example for them to follow. What works for a single parent, may not work for a household where there are two incomes. She suggested that people should read books and blogs written by several financial experts in order to establish a method that works for them. There is no one size fits all approach to managing finances. One common theme that I’ve noticed based on everything that I’ve read is that we can either spend less, earn more or do both! Some people subscribe to paying the debt off completely before aggressively saving and investing while others subscribe to paying debt and wealth building simultaneously. She also provides a list of resources for readers. She mentions that people must create their own standards for success. Take the focus off of others success and social media while we are on this topic, and make your own plans to become successful. Your goals are attainable if you stay focused and stay the course! I like to discuss my goals with my closest friends because they hold me accountable. Ms. Washington mentions that we should only take criticism when it comes with a solution! I lean on my tribe for this reason alone! Not everyone has your best interest at heart and trust me, you will lose people on your journey to success, whatever that means to you. Ms. Washington even touches on the subject of filing for bankruptcy; I am no stranger to this topic. Instead of shaming people, she focuses on how to rebuild after you’ve filed, whatever your reason was for filing and there are several reasons why people take this option. The book was instructive, entertaining, and an easy read. She includes personal stories throughout the book that many readers can relate to. I certainly did! The book offers readers the possibilities to begin a new financial journey no matter what stage of life they are in. Its solution oriented and goal oriented. I would also recommend this book to someone who does not have the basic knowledge about personal finances. It can be read in its entirety or used as a quick reference guide. In my opinion, it does not cover complex topics, just basic everyday useful information. Readers, can you recommend any good financial books for our community? Have you read the book? If so, tell us what you think! That was a good read! Keep up the good work. Really great review of the book. I’ll have to check this book out. Thank you for reading it! Very easy, basic foundation for understanding finances is my overall opinion of the book. Do you have any book recommendations? I’m getting ready to read the Total Money Makeover by Dave Ramsey. Any information on that? Base on your review will also check it out. Sounds like an interesting book that I could get in to. Taking a look at finances can be a hard subject but sounds like this book may be helpful. I like the idea of beginning a financial success journey, no matter what stage of life we’re in. It’s never too late, we just have to make time and shift priorities. Thanks! I agree , never too late . Thank you ! Wow thank you for the information! I need to check this out! Thank you for reading! Still a learning process for me and definitely looking for people to hold me accountable!